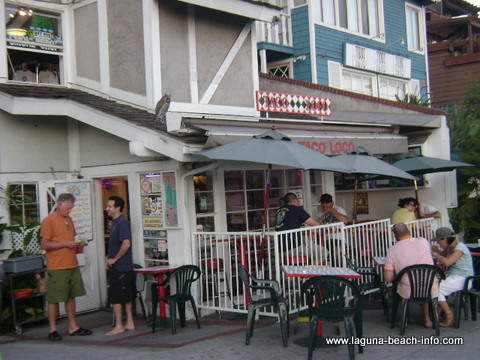 Taco Loco Laguna Beach is just about the most casual Laguna Beach restaurant that you can possibly find. This is where you’ll find the locals wearing T-shirts, boardshorts & flip-flops, sitting at tables by the sidewalk or sitting on “Paul Frank” stools on the micro-sized patio. For being such a tiny place, Taco Loco serves a wide selection of Mexican entrees and vegetarian options. My personal favorite is the blackened chicken nachos. The chips are smothered in cheese with large chunks of chicken, guacamole, sour cream, and salsa. The guacamole is fresh and chunky and the salsa is always phenomenal! And if you’re more inclined to stick to the vegetarian options- my vegetarian friends rave about the tofu mushroom burger. 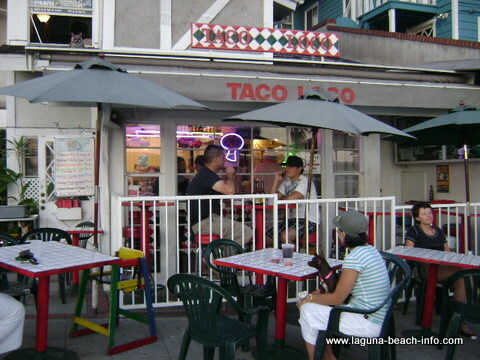 Taco Loco is always a uniquely Laguna Beach experience, so be ready to bring your appetite and be ready to do some fun people watching! Also- if you’re planning on ordering beers, be prepared to sit within one of the two white-fenced areas. Metered parking near Taco Loco is available along Coast Hwy (meters usually don’t charge after 7pm.) Free parking may also be available in the residential streets if you don’t mind walking a little bit, but remember these are people’s homes so be extra careful to not block anyone’s driveway.